I HAVE to say I love my new Shark Explore R helmet. Shark helmets seem to fit the shape of my head, so the comfort level is very good, for me. This is a big deal, especially when you are doing lots of kilometres. I think it looks pretty cool too, with the carbon fibre look. It’s made of carbon aramid fibre and multiaxial glass-fibre, so it’s not a full carbon fibre helmet, but it looks like one. Besides the comfort level and look, I am a big fan of the three-way system which makes this helmet so special. You can wear it as either a full face road helmet, with a flip down tinted visor, an adventure helmet with the goggles which come with the helmet, or a funky road helmet with goggles. If you use it with the goggles and/or peak the flip down tinted visor does not work, but you can get tinted visors for the goggles, in a variety of shades. I’ve used the helmet in all three guises. 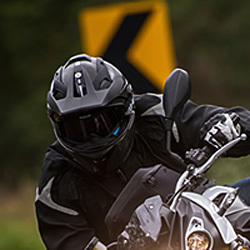 The outside visor seals very well when used as a road helmet, and perhaps even more importantly, the MX style goggles seal excellently too. I particularly like the old school goggle clip system. One side of the helmet is a quick release set-up for the goggles, so you can easily unclip that and the goggles dangle down from the other clip. Well cool if you ask me. And if you need glasses, like me, there’s load of room to wear them. I was able to wear the glasses behind the goggles without it being a pain to get them on or force the glasses against my head. I have a couple of nice helmets at the moment, but I’d have to say the Explore R is my new favourite. I can wear it on a variety of machines, and I can wear it for hours upon hours without comfort being an issue.